After many years in the industry, first as a social media agency, and now as a social media marketing software application, we have observed many cycles. As with most industries, there are cycles and flows that appear over time and social media is no different. Though not all social media accounts, brands or industry niches will experience the identical cycles, we have determined that those that really understand social media and are executing it well, will quickly recognize the flow I am about to explain. This concept is something that we have observed, modeled and used for many years, and still do today. Within your community there are ebbs and flows or “cycles” that occur. Though most social media managers are not consciously aware of this cycle, it is occurring nonetheless. So it is very important to understand the cycle, the components included within it and how it should affect your overall focus and subsequent results. The Social Media Connection Cycle is a natural process that occurs within most social media communities. By community, we are specifically referring to the friends, followers and likes that are connected to you and/or your brand within the various social networks. All of these combined connections can be referred to as your community. What Is The Social Media Connection Cycle? 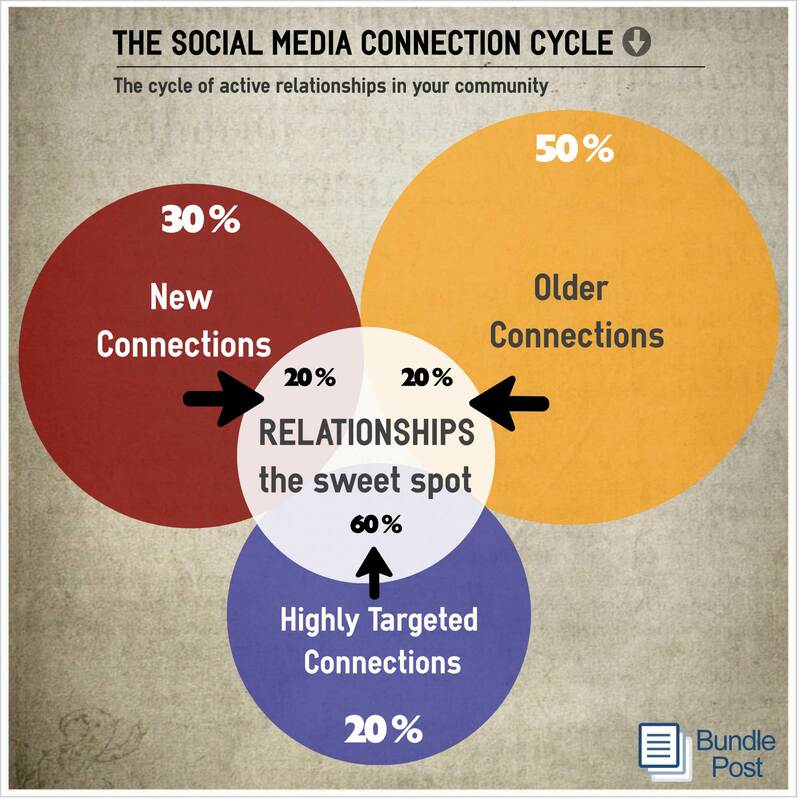 The social media connection cycle is the flow of community connections in and out of the relationship sweet spot. This natural cycle is very similar to a businesses prospect, current and past customer flow and can even be seen in one’s individual relationships. Made up of the 5 components of your community, the connection cycle concept will help you visualize the sweet spot within your social following where the magic happens and the activities you can do to continue and grow that sweet spot. Your Community – As stated above, your social community is “the combined connections you or your brand have within the social graph.” It is the envelope that contains the additional components and other elements of the cycle. The main “bucket” if you will. Inside of this bucket are the 4 segments of the connection cycle including Relationships, New and Older Connections as well as Highly Targeted Connections. We will define these separate components and discuss their specific role within the cycle, then we will wrap up with the big picture. First, the above Infographic shows that a “typical” social community is made up of 50% of Older Connections, 30% from Newer Connections and 20% from Highly Targeted Connections. Though the percentages from each of these segments may not be exactly the same for every company, marketer or niche, we have observed this to be a fairly typical scenario that makes up your overall community. Active Relationships – At the center of the connection cycle are your real, active relationships. These are the connections that you know and engage with regularly. It is really important to understand that Active Relationships are often not a substantially growing number or percentage of your overall community. What typically happens is that connections flow into and out of the active relationship cycle from the various connection types, while the overall number or percentage remains fairly constant. This is especially true when your community size is fairly static and not growing at a daily conscious pace. In fact if your social community is static or decreasing, it will often have a direct impact on the quantity and percentage of your active relationships within your social media efforts. Older Connections – The ebb and flows of your connection types within the connection cycle are often least impacted by older connections, however by no means does that make them any less important. Think of your older connections as fluid relationship connections that periodically move in and out of the active relationship bucket over time. I often think of them as those friends that you get together with a few times a year, and it seems like you start right where you left off last. The interesting thing we have discovered about older connections is that though only around 20% are inside the active relationship bucket at any given time, they represent about 50% of our new upgraded users in BundlePost. The important point here is the confirmation that social media is a marathon, not a sprint. Long-term connections, even if they are not inside the active relationship bucket TODAY, do pay off in social media. New Connections – New connections are made up of new followers, likes and friends that have “recently” connected with you on social media. Often times you can’t immediately establish whether they are a highly targeted connection, nor can they be considered an older connection, however they do represent one of the most important connection types within a healthy social community. When your social media marketing consciously executes an effective strategy to grow your community, it has a powerful impact on your active relationships. Though new connections typically only make up 20% of your active relationship segment it is one of the factors you actually have control over. When you’re actively and continually focused on growing your overall community with new connections your audience grows, the number of engagement opportunities increase and it directly impacts your active conversations and relationships. Highly Targeted Connections – The final segment of the connection cycle is made up of Highly Targeted Connections. I say “IS”, but I think the word SHOULD is probably more appropriate. If you are not consciously focusing on the connections within your community that are your highly targeted customers, prospects and influencers, you are dramatically and negatively impacting your social connection cycle. More importantly, your are likely not achieving the kind of results your social media marketing should be realizing. The concept of the social media connection cycle is intended to help you visualize the dynamic flows within your social community. They are active, not static cycles that flow in and out of the central relationship zone, which is the “sweet spot” and where you should be spending your time, focus and energy. I have made it no secret that Robert Curaso and his Company Bundle Post have helped me tremendously in my still early blogging career. I found this particular blog of his particular interesting and to the point so I thought I would pass it on to my followers through my blog. Hope you enjoy it.